WordPress is one of the most leading Blogging platforms. WordPress offers free (WordPress.com) blogging platform as well as paid (WordPress.org) blogging service. WordPress is a free open source software which lets you install your self-Hosted professional blog or website to run on it. According to latest stats, about 18% of sites all over the world are running on WordPress Blogging platform only. Many of beautiful blogs and websites have been created using WordPress blogging software. But one can’t deny the fact that a free WordPress.com blog comes with many limitations and is owned by Automattic. Similar to Blogspot which is the property of Google, your free WordPress blog may also be deleted or removed if you violate their Terms of Services. So again, there comes the need to Backup your WordPress blog. Why is it Important to Backup Your WordPress Blog? Overall, it’s related to computer and technology. Anything related to computer and technology can crash any day. Your web server might be stolen and removed from web directories. So what will you do when this would happen? Obviously, nothing. You can’t do anything other than regret for not taking backup and keeping safe the file – backup your WordPress blog. 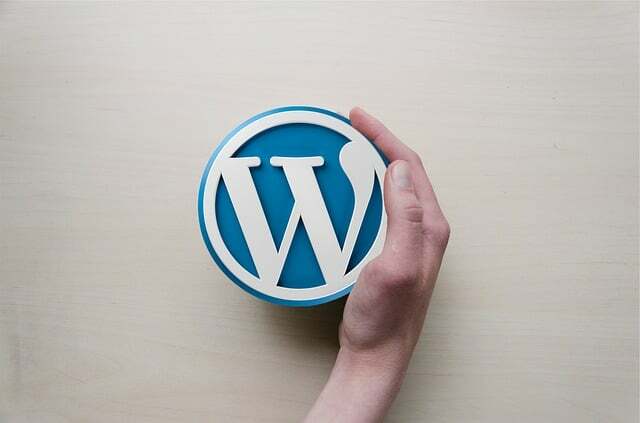 WordPress, whether it is free WordPress.com or self-Hosted WordPress.org now comes with the feature to import and export your blog which can be used to publish your blog on other blogging platforms as well as to bring your blog from other blogging platforms to WordPress. 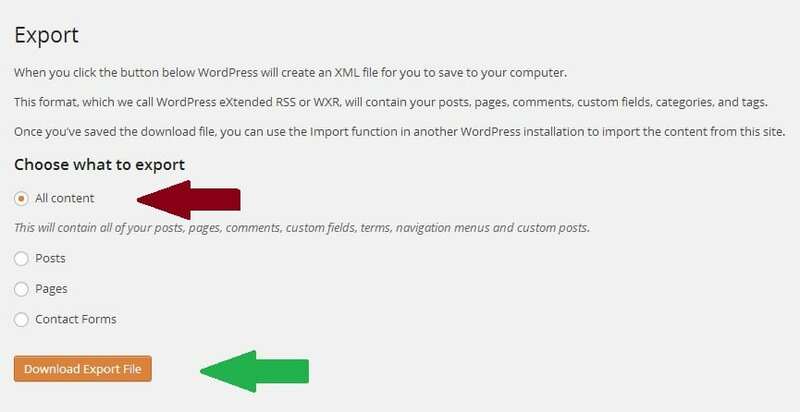 This feature is also handy to backup your WordPress blog when used smartly. 1. Login using your username and password to reach to your WordPress Dashboard. 2. Under My Blogs section select the blog whose backup you want to have. 3. 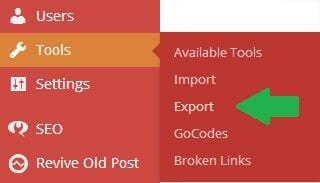 As you are here, under the Tools section select Export as shown below by marking with green arrow. 4. As soon as you click on Export, you’ll see a page like this from where you have to select All Content and click on Download Export File as shown by marking with a green arrow below. 5. Now save the downloaded file (in .xml file type) and keep it safe on your hard drive or cloud drive, wherever you think it’ll be safe and easily accessible. Congratulations ! You have successfully backed up your WordPress blog, which can be used to publish your blog on other blogging platforms or somewhere else. While playing with plugins and codes, even if you made a blunder and mistakenly deleted you blog yourself – you can publish it again using this .xml file. Taking a backup of your any blog is important as it makes sure you don’t loose your hard work, money and time even if any of cranky mind hacker went through to your admin area and you lost access to your blog’s Dashboard. Also, being a new blogger, you must have enough freedom to experiment, commit mistakes and learn from your mistakes. Getting punishment like deleting your blog or removing it is never going to help your blogging cause. Being a smart thinker, backup your blog before doing something new so that you may be able to restore is again from where you left (started doing something new). Did it help you? Do let me know via comment section below.